Twist endings can either make or break a film. For the careers of the likes of M Night Shyamalan, it can make and even rejuvenate a career as seen earlier this year with 'Split'. On the downside, if executed poorly or if the twist simply isn't good enough, it can destroy the good work throughout the rest of the film. '47 Metres Down' comes under the latter with an insultingly bad twist ending. Sisters Lisa (Mandy Moore) and Kate (Claire Holt) are on holiday in Mexico for some much-needed fun. Lisa wants to prove to her ex-boyfriend that she isn't boring and ends up being convinced to go cage diving with sharks to prove this. Everything is going great on this once in a lifetime experience until the cage breaks away from the boat, sending the sisters 47 meters below the surface. With sharks infesting the open water, the sisters only have a limited amount of time before their oxygen runs out to get back to safety. It's quite hard to talk about this film due to its twist so this review will be verging on spoiler territory. If you want to avoid this information then it'd be best to leave now and watch the movie first. However, I wouldn't say that this film is worthy of your time. '47 Metres Down' gets off to a dreadful start as we are introduced to our main characters Lisa and Kate whose personalities are told to us immediately. We are told that Lisa is the boring one and that Kate is the fun one who everyone wants to be around. There isn't anything to back this up for either of them who both seem alike other than Lisa is easily convinced by her sister. This is proceeded by the reason for these sisters going on holiday and it is to impress an ex-boyfriend of Lisa's and prove that she really is fun. Immediately there seems to be a conflict of interests. Lisa wants to get her ex back yet soon after we learn this motivation, she is in the arms of another man who she would like to be romantic with. This would be fine if the story were to drop the ex-boyfriend angle but no, it is still very much the reason for doing activities and the cage diving in particular. To top it off, this is to be done with the guys met from the previous night. This is an abysmal start which shows some weakness to the script early on. At this point, the film looks to be a complete disaster. Shortly after, we get to the main part of the story where the cage diving experience happens. In usual fashion, all is going well with the characters having the times of their lives before disaster strikes. It may seem cliched the way these events unfold but the film wastes no time and handles the situation fairly well. For the most part, the film succeeds in creating a tension filled atmosphere for most of the runtime. As made clear by the title, the film based 47 metres below the surface in what to some, including myself, is an absolute nightmare. To be trapped in the deepest darkest depths of the ocean with sharks is the stuff of nightmares and for me, I can't think of many worse situations to be in. 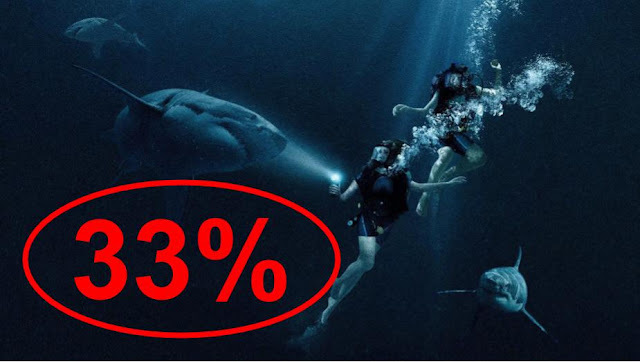 To give the film credit, it utilises its setting very well, making the sea mysterious and terrifying by showcasing the terrifying nature of the ocean. There is a magnificently well-done scene involving Lisa trying to retrieve a flashlight where the location is used to great effect. These moments are the highlights of the film as it doesn't feel like a gimmick like the shark aspects do. Instead, it feels real and that aspect makes everything much scarier and thrilling than any shark attack could. Unfortunately, the weaknesses in the script reappear as the story progresses with some terrible and quite frankly annoying dialogue. By the end of the runtime, you'll have heard the characters shout each other's names about 100 times each in what becomes mind numbing and makes the characters hard to listen to. There's a lot of times where something has happened very clearly but the characters will say the action as if commentating alongside with it. The actors aren't given much to work with here but do manage to maintain a feeling of fear whilst in this situation. The acting is far from Oscar worthy but also not laughably bad to make the characters insufferable. Moore and Holt aren't given much to work with their characters as the story is about the two trying to survive. The film does seem to provide some development in Lisa getting over her fears but the twist goes and completely ruins that. This is your last chance if you want to avoid spoilers about the twist. So the story progresses with the two main characters making their plan to try and escape with their lives. Throughout the story, the pair has communication with those still on the boat somehow and at one point, one of the characters, Taylor, on the boat warns them about Nitrogen Narcosis. Taylor then proceeds to tell them that this an effect of certain gases at high pressure which has many effects including hallucinations. This is the point where you should just stop watching the film. The next half n hour is all a hallucination so none of it even matters at all in context to the film. It even does a fairly decent job at creating a tense finale utilising the information that has been given previously. Unfortunately, all the good work that had been done to make a satisfying finale is completely erased as it did not happen at all. There are about 20-30 minutes of footage in this 90-minute feature that is all a hallucination. It is such an insult to the waste the viewers time like this. If this was only a small aspect earlier in the film, was resolved and then proceeded to give us the real, tense finale that it should. Instead, we get nothing as once it's revealed to be a hallucination, the character is easily retrieved with no problem whatsoever. This is the worst ending to a film this year as it adds nothing good at all. I went into this film not expecting a lot and it actually surprised me with how well it did at points. But the ending is so awful and leaves such a bad taste in your mouth that I cannot possibly recommend this film. Twist endings when used correctly can make you view the film in a completely different way than before and make you really think everything over. 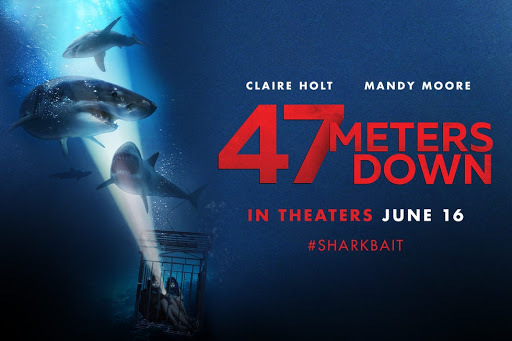 '47 Metres Down's twist ruins everything and doesn't add anything new or dramatic, making it all a complete waste of time. I don't think I've ever left the cinema as angry as I did with this film as it is so insulting to those who have taken the time to go and see it. Don't see this film, it doesn't deserve your time or your money. So have you seen '47 Metres Down'? If so, what did you think of the film? I hope that this review was useful for if you were planning on seeing this film or not, which I recommend that you stay away from. Once again, thank you for taking the time to read my review, it is much appreciated!